WC Semifinal Preview: India vs Pakistan - It's on, and other pre-game words. Here it is. The match. The one we've all been waiting for, hoping for, it's finally here. The game that thousands of dormant "cricket fans" suddenly wake up and try to hijack from those of us who had calendars marked for all its potential dates of occurrence long before the World Cup began. A game so highly anticipated, that it is believed by some (there's gotta be some) that India and Pakistan both conspired to be knocked out early in 2007 in order to double the anticipation for this encounter. Now, it's probably stupid to use logic to predict who could win this, but my Stats guy Inna Curate informs me that India and Pakistan have met 463 times in World Cups, and India has won all those games by 10 wickets or 200+ runs, even when it rained. But silly stats aren't predictive in this case, so let's not take them into account, impressive as they may be. Pakistan have had a very good run coming into this game, having beaten Sri Lanka and ending Australia's long run of World Cup wins. They had a facile quarter-final victory over the West Indies, so they weren't really tested there. It's a line-up that can be dismantled easily, since it relies too heavily on Younis and Misbah batting well in the middle overs (which they kinda do) and fireworks from Afridi and Razzaq. Umar Akmal is a sort of buffer there, who often has to change gears mid-innings. It won't be easy for the lower middle order to accelerate when Ashwin is bowling in the batting Powerplay or Zaheer is returning for his 2nd and 3rd spells. A flat pitch (which is expected) will nullify their bowling attack, making Gul and Riaz easy pickings for Sehwag and Sachin. Akhtar, if picked, could be tricky to play if he keeps his warts wits about himself - and obviously the game would be way more fun to watch. Hafeez or Ajmal may pose a few problems with the new ball, but I don't see anyone except Yuvraj or Dhoni struggling against them. India's batting will have no concerns, since everyone has runs under their belt in different situations. The only problem will be the 2nd seamer - Australia successfully targeted Munaf and his predictable lines and lengths, and Dhoni definitely didn't want to use him after the 40th over. So Nehra and Sreesanth will be in consideration, and by that I mean Nehra has a chance of playing. My picks: Sehwag, Sachin, Gambhir... every fricking one. Oh, it's on. 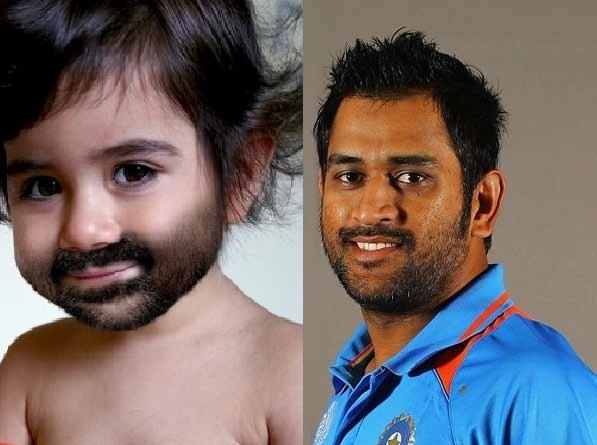 India: Virender Sehwhack, God, Gawesome Gambhir, Winrat Kohli, Man-of-the-Tournament Singh, Manly Stuff Dhoni (c)(wk), Sure-ish Raina, Harbinger-of-Doom Singh, Ravichandran Ash-win, Bowling God, Ashish Nehra. Pakistan: Incompetent Hafeez, Own-punchline Akmal (wk), You-miss Khan, Miss-bah ul-Haq, A-sad Shafiq, Pukes-under-pressure Akmal, Bats-too-high Afridi (c), Hit-and-miss-but-mostly-miss Razzaq, Only-a-death-bowler Gul, Doosra-machine Ajmal, Show-aib Akhtar. Official-looking prediction: India. INDIA. INDIA. Fights. Words. Flapping arms. Brilliant cricket. General awesomeness that will make your mind explode. 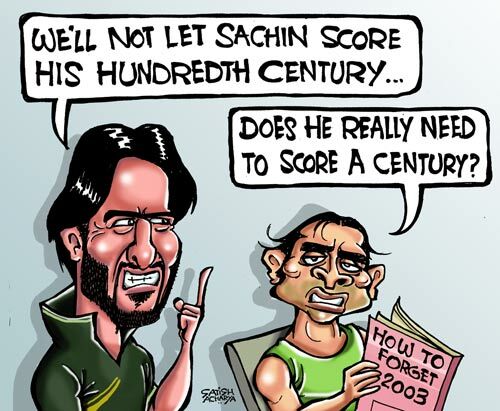 And now, I'll leave you with this, from the amazing Satish Acharya on Cricinfo.